The road to the premier class in the Monster Energy AMA Supercross Championship is not an easy one. Aaron Plessinger found his way there off the beaten path, so to speak. Coming from an off-road background by heritage, Plessinger turned heads in the motocross scene and worked his way forward into Yamaha’s feeder system, first through the Cycle Trader Rock River Yamaha team, and then Monster Energy Star Yamaha Racing team. It all hit pay dirt for the Ohio native in 2018, earning both titles in the 250 ranks – 250SX West and 250MX – which translated to a promotion to the 450 class with the Monster Energy Yamaha Factory Racing Team for 2019. Where he is today is sitting in that sought-after Factory ride in the Supercross 450SX class. A class that has a talent pool so deep, a rookie has to figure out how to swim fast. It’s definitely tough out there, but one thing that Plessinger has in his back pocket, is his roots. And those roots are grounded in off-road. He started out racing Hare Scrambles when he was around five-years old. Not long after, he started to race some motocross, and even tried his hand at Arenacross as well, but it was GNCC where he found his home. Plessinger’s budding GNCC career was on an upward climb. He even had some pro offers, but it was his dad who suggested it would be a good idea not to rule out motocross. The plan was to spend the year focusing on motocross to see where it led. It turned out to be a good plan. It led to the launch of Plessinger’s career as we know it. That didn’t necessarily mean that it was an easy decision at the time to turn down a pro deal in GNCC for the young Plessinger. If you ask him which sport he likes better, he can’t choose. Both are his favorite. And during his formative years, racing both of them helped him in each discipline. Even though he’s full bore in supercross and motocross, Plessinger has not forgotten his GNCC roots. The four-time Youth GNCC Champion wants to give back to the sport of his formative years and look for ways to help up-and-coming riders in GNCC. On March 9, Plessinger will be the Grand Marshall for the Wild Boar GNCC where he plans to talk to the youth motorcycle racers competing at the event and looks forward to reconnecting with friends and former competitors. When he made the transition from GNCC to motocross, it went pretty smoothly for Plessinger. After all, he spent most of his training time riding moto, but he readily admits, the hardest transition for him was supercross. Plessinger has never had any illusions that the move to the big class was going to be tough, but he’s also never been afraid of hard work. He also knows what works for him. 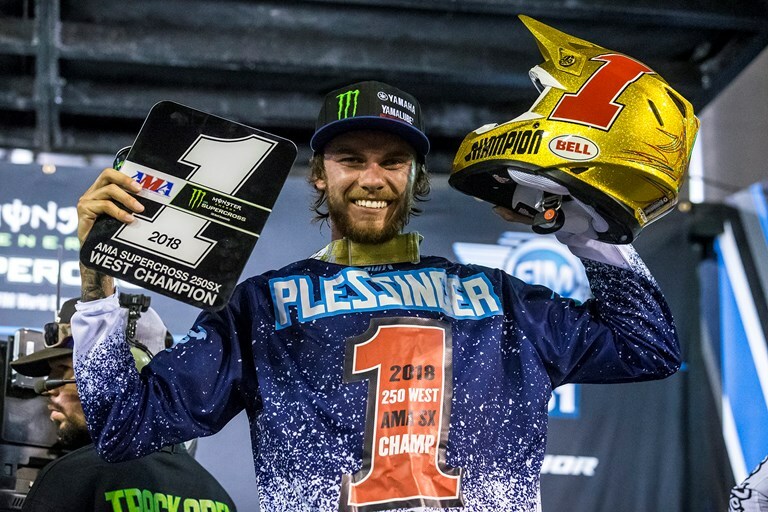 Last year was a year that Plessinger will never forget. It was a big year both personally and professionally. He got engaged, his first child was born and he took home both the 250SX West and 250MX Championships. Even though he’s gone bigger this year with a factory ride in the 450 ranks, last year’s landmark season still hasn’t quite sunk in yet.